London Glassblowing is very pleased to be participating in London Craft Week in 2017. This week-long celebration of craft in London and the greater UK brings craft to life across the city. Along with craftspeople in domains like ceramics, textiles, wood, and metal, London Glassblowing is pleased to be hosting demonstrations throughout the week. Demonstrations are free and completely open to the public. Layne Rowe – Thursday 4th of May 11 a.m. and 2 p.m.
Elliot Walker – Friday 5th of May 11 a.m. and 2 p.m.
James Devereux and Katherine Huskie, are the founders of Devereux & Huskie, a studio in Wiltshire they established in 2013. Each exceptional artists in their own right, they work as a duo to expand the parameters of glass art supporting both UK and international artists to realise their works in glass. Their studio attracts some of the finest glass artists in the country as a place to make their work. James Devereux has been working in glass from the age of 15, when he discovered a natural talent for the craft and he has been working in glass ever since. Specialising in hot glass, he is adept at working with solid forms as well as blown pieces, and an extensive knowledge of glass techniques means he is always primed for new challenges. In September 2008, Devereux opened his first studio in the inspiring Wiltshire countryside, and a year later he was pulled back to London as the glass technician at the Royal College of Art, a role that opened up vast new contacts and opportunities which are still a core of his career today. 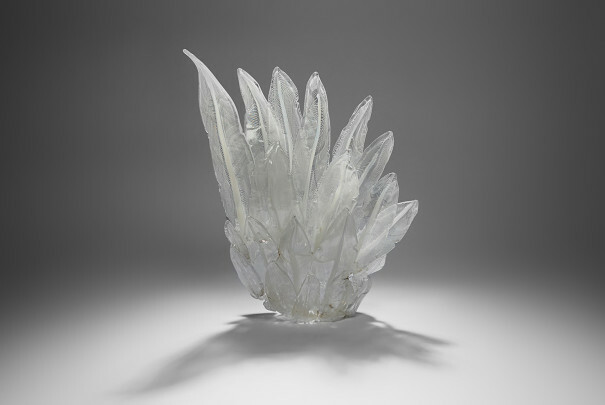 The Clovis Collection (pictured) is the result of laboured experiments by Devereux to be able to literally chip hot glass. After perfecting this unusual technique, Devereux has produced breathtaking results, monolithic pieces with smooth lines and fractured edges in juxtaposition. 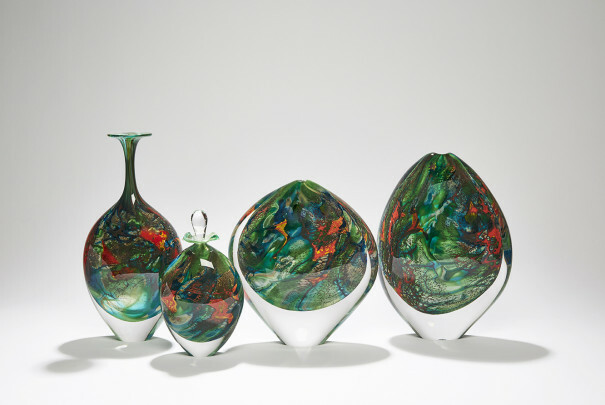 Katherine Huskie has been working with glass since 2006. 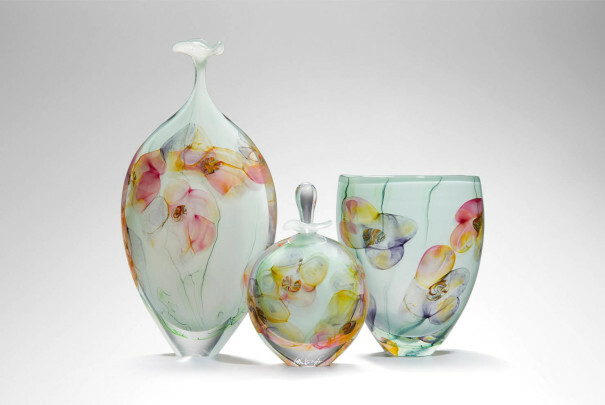 She is a glassblower and designer based in Wiltshire, UK. Glassblowing has taken Huskie all over the world including a year based in Australia where she worked with numerous different glass makers to expand and broaden her knowledge. This experience provided Huskie with the passion and determination to push her own glass designs. Huskie has always been interested in patterns whether it is within nature, textiles or geometry. she is always searching for new influences and how she can incorporate the imagery within hot glass. On graduating Layne worked at London Glassblowing for a number of years before moving to Brazil. Whilst there he set up a glass studio and later another in Hertfordshire before rejoining Peter Layton at the Leathermarket. He has worked ‘on and off’ at London Glassblowing for nearly twenty years. Layne’s work has been widely exhibited internationally, notably in the V&A’s ‘Power of Making’ exhibition and regularly at Collect at the Saatchi Gallery. In 2015, Layne won the Bavarian State Prize in the category for cane overlay technique. 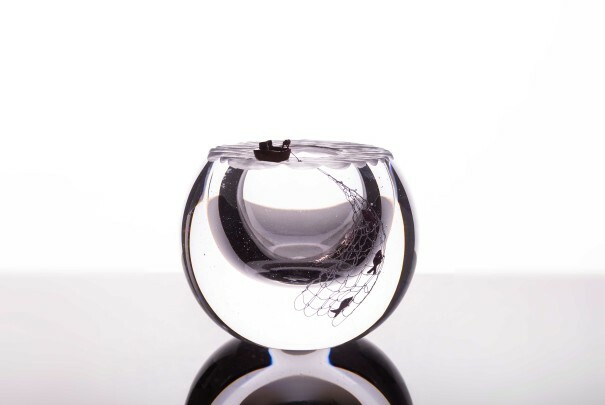 He has recently exhibited alongside Grayson Perry and Lino Tagliapietra at the Ebeltoft Glass Museum in Denmark. His recent New Horizons pieces were featured at Collect 2017, and include delicate filigrana canework. Inspired by the vast and ‘dreamy’ skies and landscape of the fens, his interpretations incorporate subtle colourways making use of double colour fades and combinations of delicate canework layered and cut in his inimitable style. Cloudlike forms reveal complex and intricate detail that calls for close investigation and repeated viewing to fully appreciate them. Following a degree in Psychology, Elliot Walker discovered and was captivated by glassmaking. Superbly skilled, he gained a Masters in Applied Arts from Wolverhampton University where he was awarded the Frederic Stuart prize by the Worshipful Company of Glass Sellers. He has exhibited widely throughout the UK and is also a member of a glassblowing demonstration/performance team, the Bandits of Glass, who regularly perform at events around the country. Pieces from Elliot’s Psycho-Physical Geography series were recently featured as part of Collect 2017, dramatic and solid forms, exploring the discrepancies between a person’s internal psychological landscape and their physical reality. Using the fluid movement of glass Elliot draws a window of a person’s viewpoint, revealing a multi-layered inner environment.